Can You Be Paid Post-Exclusion for Services Rendered Prior to Exclusion? It’s generally a fairly simple concept that an entity that hires or contracts an excluded individuals is subject to monetary penalties. But what happens when those lines get a little fuzzier? The document released by the OIG (with personal information redacted) details the case of a healthcare provider who was placed on the exclusion list with an effective date of Oct. 25, 2013. The provider also made an agreement to sell his or her interest in the medical practice in question. The query presented to the OIG by the provider was if it would be a violation for the new owner of the practice to submit payments to the excluded individual for services or items provided prior to Oct. 25. The OIG decided that because the excluded individual would be receiving reimbursement for services rendered prior to the actual date of exclusion, there would be no violation of the terms of exclusion in this case. Therefore, according to the document, the provider is free to receive payments via the new owner of the practice without any danger of additional sanctions even though he or she is now excluded. The OIG specifically states that its ruling in this case is not intended to provide guidance for any other specific situations, so you wouldn’t want to assume this sets a precedent that would be applied to all other organizations. However, it does appear that the OIG looks at the service date, rather than actual payment date, when settling questions of exclusion violation. The other key takeaway in this situation is that the provider in question apparently contacted the OIG for a recommendation on whether the arrangement would subject him or her to penalties, and that’s a smart move; with the potential for such extensive fines in place, it’s certainly better to ask the OIG for permission, rather than forgiveness. It would be foolish not to recognize the importance of OIG healthcare compliance for all types of health facilities that rely on funding from federal health programs. 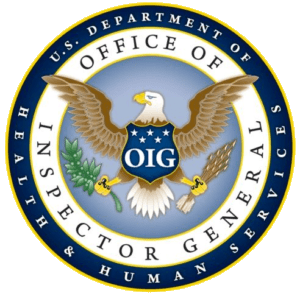 The OIG (shorthand for the Office of the Inspector General for the federal Department of Health and Human Services) is cracking down, and new guidance has demonstrated that the agency is expecting more and more from providers when it comes to maintaining compliance programs and carrying out OIG database screenings — now mandatory under the Affordable Care Act. In the first half of FY 2012, for example, the OIG imposed about $4.6 million in monetary penalties for compliance failures. Early in 2015, the OIG had imposed over $250,000 in fines in only 13 days. What’s your reaction to this situation?